June is Audiobook Month (JIAM) is in full swing! Audiobook Week is next week, I hope you’re all getting your posts ready for the daily discussion topics, and hopefully a few reviews as well. Today, though, I’m going to share another part of JIAM with you. This year, the audiobook community is giving back by teaming with the Going Public Project to offer a serialized audio story collection. All proceeds will go to Reach Out and Read literacy advocacy organization. 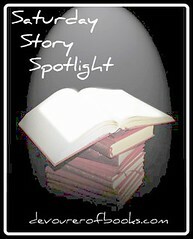 Throughout June, 1-2 stories will be released each day on the Going Public blog and on author/book blogs. The story will be free (online only – no downloads) for one week. In collaboration with Blackstone Audio, all the stories will be available for download via Downpour. The full compilation will be ready June 30th. The full schedule of the story release dates and narrators are at Going Public. Engineering and Mastering are provided by Jeffrey Kafer and SpringBrook Audio. Graphic design provided by f power design and published by Blackstone Audio. Project coordination and executive production by Xe Sands. I’m working with narrator Cassandra Campbell to bring you the audio of Giovanni Boccaccio’s The Stone of Invisibility (buy it here | read Cassandra’s post). You can listen below, and an interview with Cassandra follows. DOB: I’ve absolutely adored some of the audiobooks you’ve narrated, such as The Immortal Life of Henrietta Lacks and You Know When the Men are Gone, but can you tell my readers a little more about your career. How many audiobooks have you narrated now? What awards have you won? What are some of your favorite titles you’ve narrated? CC: First of all, thank you for taking the time to interview me! I follow your blog and am excited and honored to be a part of it! I’ve been narrating audiobooks for almost 10 years. I got started working at Books on Tape which at that point was serving the library market. Books on CD were the primary format, downloads were still well in the future. Okay, I’m dating myself here! Yikes! Anyway, the very first book I narrated was R. L. Stein’s The Sitter, Janet Stark directed me and taught me a ton, then and later. I fell in love with the process IMMEDIATELY and felt so at home reading aloud for hours at a time and immersing myself in the story and the characters. Since then I’ve narrated over three hundred books and directed probably well over 200. I have been fortunate to get to narrate some amazing stories, both fiction and non-fiction and I love the work more and more all the time. I have been nominated for 10 Audie Awards and won twice: as one of the readers of The Help and for The Immortal Life of Henrietta Lacks. I lost to Katy Kellegren this year for Best Solo Narration, but I say, if you’re gonna lose, it might as well be to someone as spectacularly talented as she is! I’ve also gotten nearly two dozen Earphones Awards and a slew of starred reviews in both Publisher’s Weekly and Library Journal. Some of my favorite titles? What comes immediately to mind is A Long, Long Time Ago and Essentially True by Brigid Pasulka. It’s a book I wish had gotten more attention in general but that came out in the same season and with a similar subject matter as The Invisible Bridge (written by Julie Orrigner and narrated beautifully by Arthur Morey) and just didn’t get the media profile it should have. The narrative alternates between a small village in Poland during the second world war and the same family years later as communism is coming to an end. It’s just an amazing story told in third and first person in alternating chapters. It was hugely challenging to do, loaded with Polish words and accents, and I was fortunate to be in studio with Gabrielle DeCuir directing (she’s phenomenal). More recently, I loved the powerful first person narrative voice of Claire Messud’s The Woman Upstairs, and Sand Queen by Helen Benedict, which I am recording now for Tantor Audio. It’s two voices as well: a female soldier stationed in Iraq at the start of the war in 2003 and a young Iraqi woman. DOB: How did you get involved in Going Public…In Shorts? CC: I have gotten to know Xe primarily through Twitter, where her presence for anyone interested in Audiobooks is not only stellar but essential. She’s fun to follow and I’ve been inspired by her weekly Going Public postings. So inspired that last fall I decided to join her and sent her one of my favorite poems, The Infinite by Giacomo Leopardi to share. I studied Italian Literature in college and grad school speak the language, so I recorded it in Italian and did my own English translation. It was wonderful to spend some time on a pet project and Xe’s inventiveness is a wonderful to all of us. So when the opportunity came up to be part of this project, of course I wanted to participate. DOB: Tell us a little about the story you chose. Why did it appeal to you? CC: When I was a sophomore in college I read Giovanni Boccaccio’s The Decameron in Italian. It was a break through for me at the time to realize that this piece of classical literature, remote in time and with such an intimidating title, could in actuality be so funny, lively and easy and so accessible. I was converted, I loved these stories. And as the neophyte, I wanted to share them with people, to give them the same experience I’d had, with the idea that these stories aren’t just for the super educated and the elite, but that people like me, small town and not very sophisticated, could really enjoy them. After college I wrote a screenplay (it was bad!) based on some of the stories (I’d seen the Pasolini movie and didn’t like it!). Then life took me in other directions, a theatre career, marriage, kids, audiobook work…but the stories have always been in the back of my mind. Boccaccio wrote them at the end of an outbreak of the Black Plague in Florence in 1348. (He offers one of the most vivid descriptions of the plague extant anywhere.) The stories were dedicated to women (this I loved right from the start!) They poke fun at religion, sexism, social mores, and foolish husbands. They’re playful, they’re quintessentially Italian, they’re bawdy. Calandrino, who is the protagonist in the story I recorded, is a recurring character in several of the novelle. He is a buffone, he’s like a stock character from Italian Commedia. His name means ‘colander’. You know, head like a sieve. Interestingly, coming back to the stories, I did shrink a bit at the cudgeling. But it was of it’s time certainly, and like Shakespeare’s Falstaff, Calandrino the shirker, the swindler, the scoundrel, gets his due in the end. DOB: If you had to recommend two audiobooks -one you narrated and one you did not – for people to listen to this audiobook month, what would they be? CC: I’d listen to Kathe Mazur reading Quiet-The Power of Introverts. Kathe’s incredibly talented and this book is not to be missed. As for my narrations, well, in addition to the many I’ve already plugged, there’s a lovely collection of short stories called Birds of a Lesser Paradise by Megan Mayhew Bergman that I just adore. And don’t forget to visit Kevin Herne’s blog tomorrow for another post. If you read my January wrap-up, you would know that I chose not one, but two books this month as my ‘pick(s) of the month,’ a remarkable thing indeed. Both of these books were published by Amy Einhorn Books/Putnam, one of my very favorite imprints, and they were the sort of book that I need to read again – enough so that I am planning to buy them both in hardcover, as well as listen to them in audio. Actually, I’ve already listened to You Know When the Men Are Gone, and it was fabulous. The narrator, Cassandra Campbell, made everything even more poignant. I haven’t listened to The Weird Sisters yet, but it is going to be one of my next few audiobooks, and the author, Eleanor Brown, had nothing but good things to say about the audio adaptation. I am happy to announce that, thanks to the generosity of Eleanor Brown (website | facebook | twitter) and Tantor Audio (website | facebook | twitter), I have a copy of each of these books to give away in audio. The copies were provided to me for giveaway, but I will actually be sending them, so let’s go ahead and open this up worldwide! You can enter for both The Weird Sisters (nine audio cds) and You Know When the Men Are Gone (one mp3 cd), or just one or the other. The same person could conceivably win both, but I will be choosing winners separately. Enter by filling out the Google form below by 11:59 PM Central time on Sunday, February 13th. Winner(s) will be notified by email. Welcome to Saturday Story Spotlight, my new feature where I discuss books my husband and I are reading with our son, Daniel. These are books that he, we, or all of us particularly enjoy, since we are definitely reading more than one book a week! 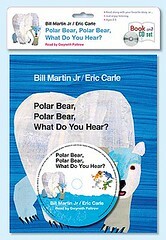 “Polar Bear, Polar Bear, What Do You Hear?” companion or sequel to “Brown Bear, Brown Bear, What Do You See?” Like “Brown Bear,” it has predictive text with each animal hearing another, which then hears another. In some ways, I actually prefer this one, because of the rich descriptions of animal noises (the boa constrictor ‘hissing,’ the elephant ‘trumpeting’). Plus, we’re huge Eric Carle fans around here, so anything he has written or illustrated is a big hit. I will say, that even with my confidence in all things Bill Martin Jr. and Eric Carle, I was a bit hesitant to try the audio book with Daniel. For one thing, I was totally unsure how Gwyneth Paltrow would do as a narrator. What I didn’t take into account was that she is a mom who clearly has lots of experience reading to her own young children, because she read with spot-on ‘mom reading to toddler’ enthusiasm, fun voices and all. Because of this, Daniel definitely enjoyed the experience of listening to the audiobook while sitting in my lap and having me turn the pages. It isn’t an option I would use frequently at this age, but I can see doing it when I have a sore throat or otherwise don’t feel well. One nice thing, though, is that there are three different options on the audiobook, depending on what age and level reader you have. The first track is simply the book being read without any interruptions, which works well for reading the book with a parents or potentially for an older child who can read along or determine when to turn the page through animal cues. The second track would be wonderful for an emergent reader or even a pre-reader, as there is a chime to indicate when the page should be turned. I can even see Daniel being able to turn the page at each chime on his own in a few months. The third track is in Spanish for bilingual families, or, I suppose, simply if you wanted to expose your child to another language. I really appreciate that we can pick up just the book itself, or add the cd if need be. Although I don’t think we need any more audiobooks for Daniel for the stage he is in, I can definitely see him growing into this format on his own as an older toddler or preschooler. As Billy prepares to take another group on a tour through The Darwin Center, where he is a curator, he expects nothing but an ordinary day at work. Billy’s day is going to be anything but ordinary, however. When his tour reaches the room where the Center keeps its giant squid, the kraken, the beast has mysteriously disappeared from the glass tank in which it is kept. All of this would be odd enough, but the disappearance is being investigated by a special arm of the police, the cult (and, essentially, magic) squad who suspect that the Krakenist religion – The Church of God Kraken – may be behind the whole thing. Before too long, Billy actually finds himself evading the police and working with a renegade member of The Church of God Kraken in a desperate attempt to locate the squid before this left causes the end of the world. 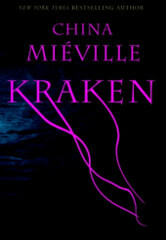 Just as in “The City & The City,” in “Kraken” Mieville takes me on a journey that I never expected. “Kraken” is a remarkably inventive story. I went into it completely blind, knowing nothing but that I had loved “The City & The City” so I was not expecting the whole religion/cult/apocalypse angle and I absolutely adored it. I did think that the story lost a bit of steam in the middle. It is over 16 hours in audio or 500 pages in print, so perhaps it could have used a slightly stronger editor, someone to keep the plot moving a little more in the middle. Regardless, the entire thing was so novel – even after 10+ hours – that the pacing problems did not particularly bother me. John Lee is a fantastic narrator and did a great job with this challenging title. You can see my entire review of the audio production at AudioFile Magazine. 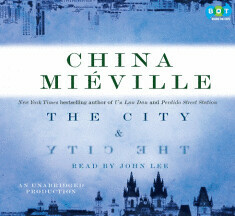 If you are only going to read one Mieville book, I do think I would still recommend “The City & The City” over Kraken, largely because I think it had better pacing, but this is a fabulous story that works will in audio and seems that it would be equally fabulous in print. This review was done with an audiobook received from AudioFile Magazine for review . When a young woman is found murdered in Beszel, a city-state somewhere in Eastern Europe, detective Inspector Tyador Borlu finds himself pulled into a mystery with sticky inter-and trans-national implications, forcing him into the ‘neighboring’ city-state of Ul Qoma, in order to solve the crime before he becomes the next victim. I absolutely adore the world that Mieville created in “The City & The City.” An outside observer would say that Ul Qoma and Beszel were one and the same city, but the residents and governments of the two city-states would soundly disagree. Since the two were meant to be different countries, although they were geographically intertwined, residents of one city could not interact with – or even admit to seeing – residents, buildings, vehicles, etc. of the other city without first crossing the border and visiting the other city. This made for a fascinating aspect of the story with all of the un-seeing that everyone was forced to do, and allowed the addition of various radical groups vying either for unification or more complete separation of the two entities. The disparities between the two cities was also very interesting, with Ul Qoma booming and Beszel flailing, but attempting to lure in new investment. It was, of course, the murder investigation that drove the story, but, although it was well done, I just wanted the chance to live in and explore this world. John Lee has earned himself a place on my ‘narrators to follow’ mental list with his narration of “The City & The City”. As confusing a plot as Mieville put together, the audio could have easily been a disaster, but Lee narrated confidently and clearly, treating the oddities of Beszel and Ul Qoma as common place. Additionally, I am forever indebted to him for an idea how how to pronounce the names of people and places in “The City & The City.” If I had attempted the print version, I think that I would have spent an inordinate amount of time attempting pronunciations in my head. I love, love, loved the story, and loved the audio. Highly recommended. This review was done with a book borrowed from the library.